If you need an outdoor water filter to make chlorine-free water for your ponds water and to reduce the hardness in the water y, or to remove the chemicals and chlorine from the water that fills your outdoor fish pond, here's the easy and inexpensive way. 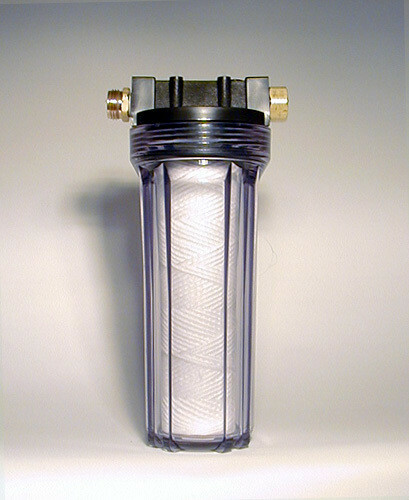 Our basic garden-hose filter uses standard-sized filter cartridges and connects to standard 3/4" garden hose fittings. You'll need two hoses--one to provide an inlet and a second to deliver the water to its point of use. The adapters are included as well as a mounting bracket in case you'd like to hang the filter on a wall or the side of a garden cart. Clear Garden Hose Filter (at right) includes hose-adapter fittings (installed), filter wrench to assist in cartridge change, and mounting bracket (not shown). The clear version is handy with sediment cartridges especially, because it lets you see when the cartridge needs replacement without opening the vessel.